We all know who Orange is. World renown for making some of the nicest, sleekest valve amplifiers, they’ve been working on a high gain monster. Behold, the Dark Terror! The idea behind the Orange Dark Terror begins in the already established control scheme of the Orange Thunder series of amplifiers, but brings in a brand new high gain preamp comprised of three ECC83 tubes. This amp will probably sound like a beast, and being only a 15-watt amp, you’re going to be able to rip it up wherever you are. Though, considering its class A wattage, this thing might be louder than you’d think. There are four stages of gain. This is pretty awesome, considering the versatility it’ll provide. If only every amp designed allowed you to operate at multiple stages of gain (most do now), they’d be more flexible. The wattage of the amplifier can be switched from 15 to 7 watts. The amp also houses a Valve Driven FX Loop made up of one ECC81/12AT7 tube. With just a volume, shape, and gain knob, this amp has no secrets really. It’s going to rip, and it’s not going to need very much to get there. The shape knob, familiar from Orange’s Thunder series of amplifiers, is guaranteed to craft the tone of the Dark Terror to your liking. With the support of its high-gain valve stage, this amp is SURE to bring the Terror! 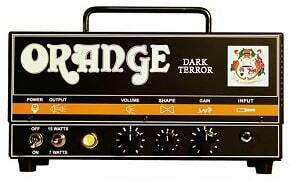 For its introductory MSRP of $650.37, the Orange Dark Terror is somewhat affordable to the everyday musician. For someone that doesn’t want something that’s over-the-top powerful yet full of valve tone, this amp could be the one. I imagine that most metal heads will be extremely curious as well as skeptical of how grimy and dirty this thing can get. 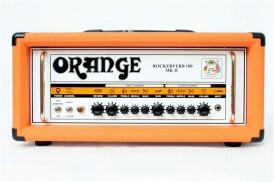 I know Orange, and even heads like their Rockerverb can just destroy some high-gain amplifiers, so I’m guessing this guy’s going to be a little box of mayhem. 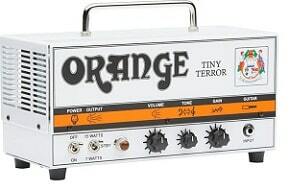 If the guys at Orange did their homework, the Orange Dark Terror will probably be a great amplifier, and will probably be requested by most shredders looking to get their high-gain groove on.